Dacia announced the Duster prices for Romania, which are from 10.500 euro (VAT included) for the 4×2 version, and from 12.300 euros (VAT included) for the 4×4 version. The prices can reach 15.600 euros for the top version powered by an 1.5 liters diesel engine with 110 HP. You can order the Dacia Duster starting from today and the deliveries will begin in April. 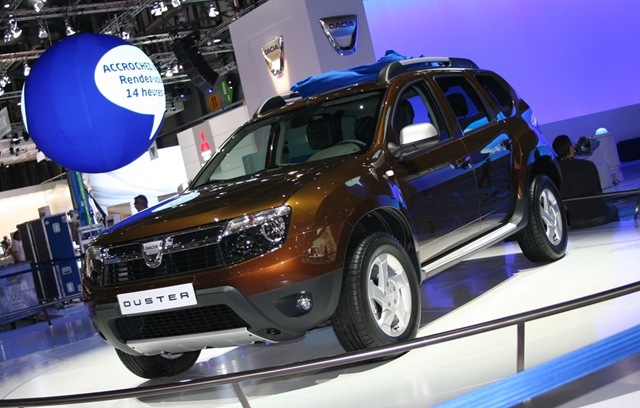 Dacia Duster is available in three version of equipment: Duster, Ambiance and Laureate. The price for the 4×4 Duster version will start from 12.300 euros. For the top version – Laureate- the price starts from 11.900 euros for the 4×2 model powered by an 1.6 liters gasoline engine and 105 HP, and 15.600 euros for the 110 HP diesel engine. Dacia Duster Laureate powered by an 85 HP diesel engine has a price starting from 13.050 euros (VAT included). Dacia Duster Laureate with all the options available included has a final price of 17.600 euros. Dacia Duster will be launched in this spring in Romania and the rest of European countries plus Turkey, Algeria and Morocco. In June, Duster will arrive in Ukraine, Israel, Jordan, Syria and Egypt, and in 2011 will be launched in Brazil, Russia and Gulf countries under the Renault logo.